Strive to produce Navy and Marine Corps Officers who are well grounded in critical thinking, analysis, and problem solving. Give our majors the opportunity to develop the mathematical foundation required to pursue advanced technical degrees. Provide an active learning environment (with appropriate use of technology). Are committed to excellence in teaching and scholarship. The United States Naval Academy was founded 1845. The Mathematics Department has offered a B.S. degree in Mathematics since the 1960's. 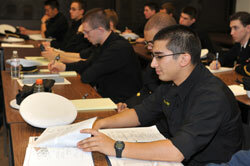 We graduate about 35 Midshipmen mathematics majors each year. The Naval Academy Mathematics Department consists of about 60 faculty members, who, as a whole, are actively engaged in state-of-the-art research in mathematics and its applications. About 17 members of the faculty are active duty Naval or Marine Corps officers (all with master's degrees); they bring first-hand experience in applying mathematics and mathematical thinking to specific naval problems. The civilian faculty (all with doctorates) devotes a substantial portion of time to current research in various specialty fields in pure and applied mathematics, as well as in operations research. Read more information about the Math Department. The Mathematics Major teaches midshipmen to think logically and critically; these fundamental abilities are valuable to the naval officer. Mathematics plays a central role in virtually every technical and scientific field and is crucial in modern, accurate models of the environment. Mathematics provides training in analyzing problems, formulating methods of attack, and expressing results in a clear and logical manner. These same skills are applied aboard a ship or submarine, inside a fighter jet, and in all military communities. Please read more about the math major.